Too often the phrase “end of life” is synonymous with DEATH. 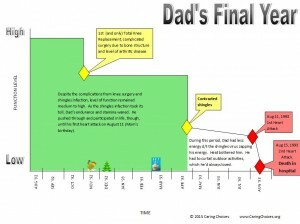 When Jim and I talk about end of life, we focus more on the final year of life. The moment of death is just that … one moment. One minute you’re alive, breathing on your own (or assisted with machines); the next minute, you’re not. Sounds harsh, right? But yet each of us will face that final year of life, as will those who share life with us. It’s difficult to comprehend, isn’t it? Many final years will only be examined in retrospect by those left behind, as I’ve done below about my parents. My Dad’s final year (August 15, 1992 to August 15, 1993) was spent building my house, working on my brother’s store, and fixing things up around his and Mom’s house. He went to church every Sunday as he did his entire life. He enjoyed holidays with big family gatherings. He watched his grandson play baseball and soccer. He volunteered as a Fire Policeman for Tuckahoe Fire Company. He helped people with their carpentry projects. He read his Bible. He enjoyed Mom’s home cooked meals. He loved and ate a lot of ice cream. He lived life. He also had high blood pressure and was taking medication (for several years). He had high triglycerides (and also took medication). He was overweight by probably 30-40 pounds. He had arthritic knees and required replacement. He replaced one in November 1992. He had a painful recovery that lasted for six months. Then, he got shingles which he suffered with — they were intensely painful — for a couple more months. He saw his kids turn 35 and 30. He celebrated his oldest brother’s 50th wedding anniversary (that’s the last picture I have of Dad and Mom together). On August 11, 1993, he had his first heart attack which sent him to the hospital. During the next four days, we all assumed Dad would be coming back home soon. On the morning of August 15, 1993, he had his second (and would-be-fatal) heart attack. He died 14 days before his and Mom’s 45th wedding anniversary. 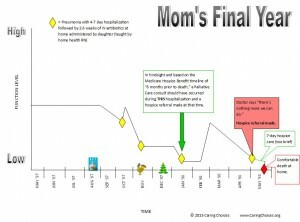 My Mom’s final year (May 17, 1997 to May 17, 1998) was not as “busy” as Dad’s but then Mom had a chronic illness since she was a little girl, which limited her functional level each year as her age and disease progressed. But she still lived life on her terms, taking care of my son while I was at work, cooking and baking as much as she could, enjoying her soap operas on TV, and having family holidays one last time. Mom’s lung disease – Chronic Obstructive Pulmonary Disease (COPD) – was much more “predictable” than Dad’s heart attacks. Trying to wrap our brains around the fact that some period of 12 months will be our final year of life is daunting. The real challenge is in knowing when we begin our final year. COPD and heart disease (not acute heart attacks), like many chronic illnesses, have baseline trajectories that physicians can use to better project disease progression and prognosis. There are a lot of fancy disease trajectory images on the internet but I drew the two below to illustrate that even in the “final year,” there are points of interest not only in living our lives but also in planning for the future … typically a future without us in it. Like my previous blog on Recognizing the Signs, these trajectory graphs illustrate the importance of knowing how to recognize and react to the signs that our bodies are giving us. The signs are more readily apparent for people like my Mom than people like my Dad. Understanding that diseases have trajectories can help us better prepare for that final year – the end of life – and not just focus on the moment of death. When patients and their families understand what’s ahead, and they’re given tools to prepare for anticipated scenarios, they will have better outcomes. They won’t cheat death, but they may savor more of their final 365 days knowing that they’ve made a plan that will help them and their loved ones when that final moment arrives. Caring Choices focuses on living through the end of our lives, not merely planning for the final days/hours leading up to death. It’s not easy to talk about, but ignoring it won’t make death go away. We can help you talk. We can help you plan. We can help. This entry was posted in Advance Care Planning, Personal Stories on September 7, 2015 by Cindy Moyer.